This week is The Book of Biff’s 5th birthday! Were celebrating in two exciting ways. First is the big birthday sale – all books in the store are 25% off for this week only! It’s the biggest sale we’ve ever done! Plus all this week I have the amazing privilege of running guest comics by some of my favorite people in the world of comics! Today’s strip is by the multitalented Zach Weiner of the comic Saturday Morning Breakfast Cereal! Back in 2006 when I first found Zach’s comic it was the only other single panel strip I new about. His success with a single panel strip gave me something to aspire to. To top it off, when I contacted him via email he was extremely friendly and helpful even though I was only a few months into this 5-year-long journey. Every new round of emails had him asking me for updates on my progress from the last time we spoke. Since then Zach has really let himself go and his sparse single panel strip can barely get through the day without 12 panels now. If you are one of my few readers that aren’t already a fan of SMBC then go read his strip now! And if you are in the New York/New England area go to the launch party of his first book on May 8th! BIFF HAS A MOUTH. Oh, wait, has he opened it before in our view? I can’t remember. Is this some reference to popular culture or some meme I should know about? Just goes to show what was suspected all along. Biff is an immortal. Would love to have seen some of his Renaissance Era adventures! But then Zach Weiner specilizes in scary plausibility. Is he alluding to Biff possibly being a Watcher from “Fringe”? 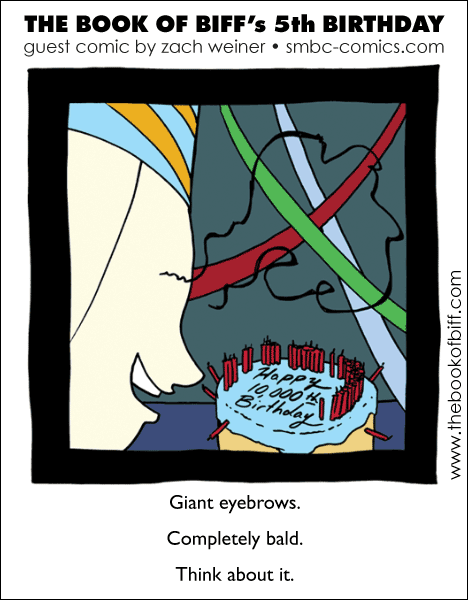 I think he’s referring to old men with really long eyebrow hairs. Look at the cake. Well, that’s quite alot of candles.